Hehehe.. Sorry if my this photo scare you! Anyone still remember this classic toy we played masa 80's? 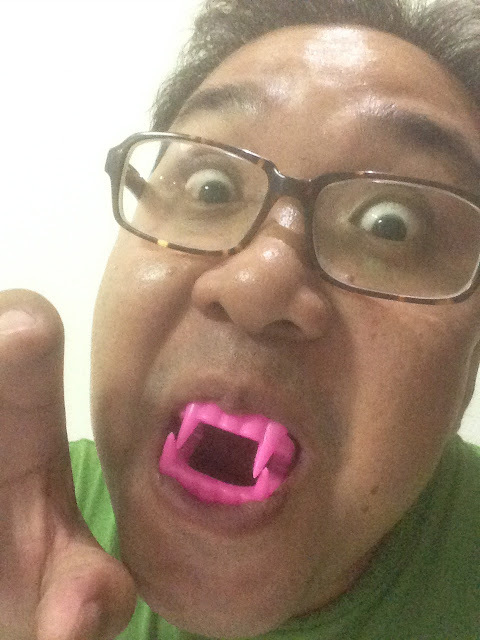 I don't remember this thing how much already but I do remember last time we bought a small yellow box inside got secret prize some time is a marble, ring, green soldier, 50 cents if you are lucky you may get this vampire teeth!!! We like to play this masa primary school and scare the classmate. Back in the 80's this is very popular to play.. I guess is because we watch too much the Hong Kong zombie moive lah!! I think I got almost 30 years did see this toys already.. can't believe I still can found this here. Ya lah as usual lah.. last week I went to Telanai there Hong Bee ( behind the QAF Supa Save) there see see look look got what new old toys arrive!! I found that this vampire teeth it bundle with the Soldier Parachute together!!! The parachute also long time no see too... Then also I found the small gun you put the cracker inside it go Piang Piang sound one!! What a lucky day I can found them back! I bought it home can't wait the play it with my kids at home! I think they also watch the Walking Dead movie so they also automatic know how to play with it... walking around at home open their mouth like zombie there LOL.... The parachute no suitable for my girls lah... is more for the boy!! FYI... the airplane is back to stock again now and they have new model of the plane!!! If you want to buy better fast fast go oh... limited stock there after I post this sekejap finish tu!!! Buy for kids birthday party also not bad right... each coming kid give them one and play!! This one I also long time no play.. But I like the red paper in roll one... the gun powder is one small dot dot, once you fire few time can tear it off one... ah that one more fun!! also long time no see too! The plane I posted last month remember(Click HERE)?? Now got new stock already! !